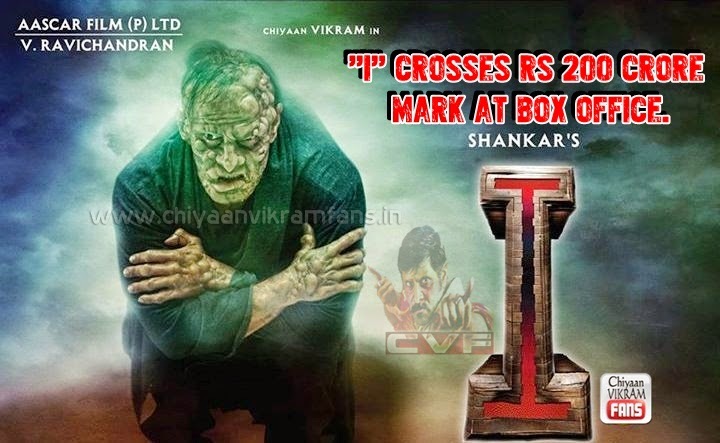 Chiyaan Vikram’s "I" crosses a shattering 200 crore mark at box office; enroute to match Enthiran’s record! The fanfare surrounding Vikram’s I reached it’s peak, when the long awaited film finally hit the screens this Pongal. Taking into the account the wide spread promotions and the buzz around the film, trade experts predicted a strong opening for I at the box office. Though the film was panned by the critics for a weak story line, the film had managed to silence them by making over a 100 crore at the end of the first week. Before the Vikram’s I had seen light, fans were comparing it with director Shankar’s Enthiran starring Rajinikanth, wondering if I could manage to out do Enthiran at box office. Looking at the box office figures, I would not rule out I’s chances of actually surpassing Enthiran’s figures. Though Vikram-Amy Jackson starrer did lukewarm business with it’s Hindi dubbed version, it’s Tamil and Telugu version made sure that Shnakar’s I rakes Rs 200 crore at box office in matter of three weeks. The film did exceptionally well at the international market, as I made a large chunk of its profit from US, Malaysian, UK, Canadian and Australian box office. Now the trade experts are wondering if I can actually beat Enthiran‘s box office collection, which was a whopping Rs 256 crore. With a big film like Ajith’s Yennai Arindhaal releasing this weekend, it would be interesting to see if I manages to hold it’s ground at the box office.